Applications should be fully completed by the program deadline (see Application Deadlines). Please read all application instructions carefully and double check your entries before submitting your application. Once an application has been submitted you will only be allowed to re-enter the application to check on the status of your application, to view messages, and to resend email notifications to recommenders. If you discover that you need to correct any information contained on your application, please send an email to the appropriate Graduate School office (Bowman Gray campus – bggrad@nullwakehealth.edu; Reynolda campus – gradschl@nullwfu.edu) identifying the incorrect item(s) and including the correct information. Applicants will receive an email confirmation after submission of the application. Once you have submitted your application please be sure to submit any remaining supplemental material required for the completion of your application. Your application will not enter the review process unless all material has been received and verified by the appropriate Graduate School office. As your supplemental application material is received, your Application Status panel will be updated and will reflect receipt of your supplemental material. You may log back into your online application via the links above anytime using your Personal PIN and Password. Applicants may apply to multiple programs by submitting a complete and separate online application for each program of study. Your online recommendation providers must also submit an online recommendation for each program of study they have been listed as a recommender. Unclassified students are individuals who wish to take graduate level classes either for credit or audit, but do not wish to pursue a graduate degree. Application procedures are unique to the campus location. If you are unsure as to which campus to make application, please visit our Reynolda and Biomedical academic program pages for a complete list of master programs and PhD Tracks as well as their campus location. Please review our academic programs and choose the program(s) to which you plan to apply (note campus location of the program(s) for future reference). Request an application fee waiver. A limited number of waivers are available to students who meet the eligibility requirements. 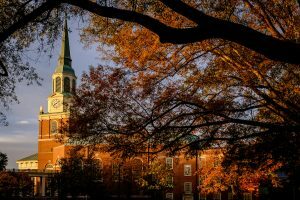 Undergraduate seniors and graduates of accredited U.S. colleges and universities or recognized foreign institutions may apply for admission to the Graduate School for study on the Reynolda campus or the Bowman Gray campus. Undergraduates must complete their degree requirements prior to entering the Graduate School. The Graduate School also accepts applications from holders of the MD, DDS, or DVM degrees, or from candidates for these degrees who will have satisfactorily completed the prescribed medical curriculum prior to matriculation in the Graduate School. Whatever your previous academic training may have been, all applicants should have superior records. This requirement is usually interpreted as at least a B (3.0 GPA or greater) average or standing in the upper quarter of the class or both. Students who would like to reapply for admission should submit a new online application including the application fee, and uploading a statement of interest, unofficial transcripts, test scores and any additional materials that may be required by the individual program. Letters of recommendation will also need to be resubmitted online by recommendation providers. Applicants will need to use a different email address when submitting a new application. Official test scores received by the Graduate School will not need to be sent again. Applicants for master’s degrees who have completed a portion of their graduate training at another institution are eligible for admission but may not transfer for credit more than six semester hours of coursework. The minimum grade allowed for transferring courses is “B”. The above limitation does not apply to applicants for a PhD degree. An official release letter is required from the applicant’s current institution. In addition, one of the three required recommendations must be from the students’ advisor or mentor who has knowledge of the applicant’s academic performance and supports the applicant’s request for transfer. The applicant should also outline the reason for the transfer in the personal statement. In addition, it is recommended that the applicant contact the director/recruiter of the program of study to which he or she wishes to make application to discuss the circumstances of the transfer. For Biomedical Graduate Programs, visit our pages on the School of Medicine website.